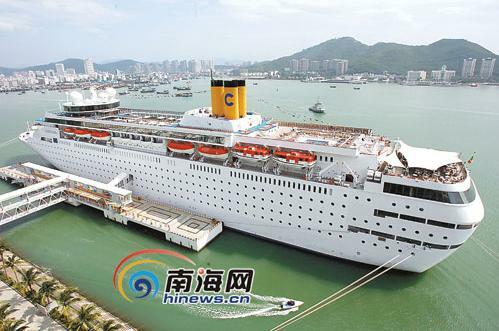 As a hot tourist destination in China, Sanya stirs up tours on cruise liners. According to the Hainan Transportation Ministry, the Sanya Phoenix Island International Cruise Port is building a Phrase II project with 5 terminals for 30,000 to 250,000 dwt ships. After the construction, the Sanya Phoenix Island International Cruise Port will become the biggest and best cruise home port in Asia, with a total of 6 terminals for 30,000 to 250,000 dwt ships. The Sanya Phoenix Island International Cruise Port has received more than 380 voyages of international cruise liners such as “Star”, “Carnival” and “Royal Caribbean” since it put into use in 2007. In 2008, the Sanya Phoenix Island International Cruise Port topped nationwide in the number of inbound and outbound tourists, hitting over 190,000. It’s estimated that Sanya Phoenix Island International Cruise Port will receive 118 voyages of cruise liners with nearly 200,000 tourists from home and abroad this year, among which 42 voyages of international cruise liners have called at the port in February.